Ken Grossman, founder of Sierra Nevada Brewing Company, and Vinnie & Natalie Cilurzo from Russian River Brewing are all in the studio today with Mark Carpenter and Herlinda Heras. Steve Jaxon is away and Pete Foppiano is sitting in for him today. 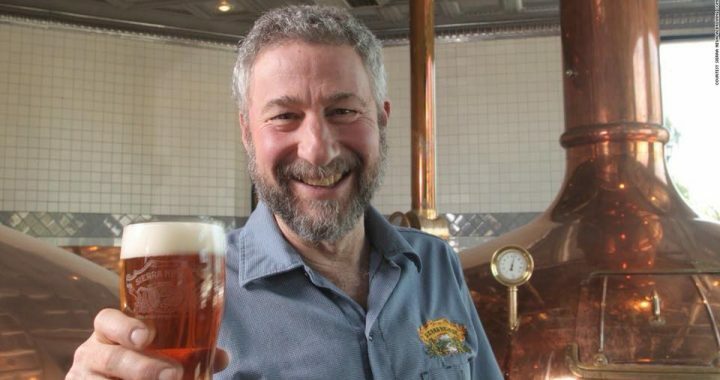 Mark Carpenter introduces today’s guest, his old friend and colleague in the beer business, Ken Grossman, founder of Sierra Nevada Brewing Company. He started Sierra Nevada in 1980. He made his first batch of pale ale then. He had aspirations to be one of the new small brewers in America. At the time there were only about 40 small brewers in the country. A lot of breweries were started back then and it was a challenge to get a distributor to carry a new beer. Mark asks Ken Grossman about Sierra Nevada Pale Ale. Ken just gave a talk a few weeks ago and he studied his old notes for his first commercial pale ale. They actually brewed some IPAs when he was home brewing in the early 70s. He tested an IPA and thought it was too strong. His pale ale, at 38 bitterness units, was too strong for people’s tastes at first. Now it is successful because he balances the hops and malt just right. It’s the genesis of what happened later in craft brewing. Beer drinkers appreciate balanced flavors. Sierra Nevada Pale Ale is bottle-conditioned. Herlinda asks what that means. Ken tells that in 1980 he built his facilities himself. They did not have a pressurized tank. So the beer’s final carbonation takes place in the bottle in a 5 week process of aging to develop the carbonation. There are few breweries that practice this. Ken remembers buying some filtering equipment from Anchor when Mark worked there. Pete asks about the evolution of consumer tastes. He comes from the wine industry which has seen changes in tastes. What about beer? Ken says that the domestic lagers were nowhere near as bitter as the new craft beers. They produce beer in the 60 tp 80 bitterness units, which is quite high compared to back then. Also, there are more hop varieties in circulation. The US hop crop was dominated by the cluster variety, for its bitterness and not for aroma. Now, America produces most of the strong aromatic hops. Mark says that America is the brewing leader today, we used to go abroad to learn, and now they are coming here. Herlinda asks Ken to describe how they made an agreement with a small German brewer interested in exploration and expansion. They are doing their fourth collaboration now with a German company Weinstephan, coming here to learn IPA and Ken learned an Octoberfest beer from them. Ken is a self-taught engineer who built a lot of his own equipment. They have just opened a bottle of Brux, a collaboration between Russian River Brewing Company and Sierra Nevada. Brux is a Belgian-inspired beer. They added a wild yeast to give it a fruitiness and spiciness. Most beer should be consumed fresh but this is a beer that can be aged because the yeast is fermenting very slowly. Normally the hop-heavy IPAs shouldn’t age, as the aroma and flavors will degrade. Dark beers based on malt body will do better if aged. Ken tells about his daughter Sierra who has been working in the brewery since she was a child and his son is also involved in the company. He has had opportunities to sell his business but he says he had a passion about beer from an early age and he enjoys the work so if he can pass it on to the next generation, that’s great. But it is an interesting time in the US brewing market. The craft brewing segment is the only segment that has seen growth in the beer business, so the big companies have been buying. Vinny Cilurzo says that Sierra Nevada is part of his inspiration for his own company.